Petaling Street is the center of Kuala Lumpur's original Chinatown. It's the place that never sleeps. Adventurous visitors should not miss a walk on Petaling Street. Even in daytime you have great bargains. Petaling Street is not open for the traffic. It is a great place for locals to get some goods at bargain prices and certainly an eye-opening experience for tourists. Chinatown has a bustling market serving as a bargain hunter's paradise and one of the premier shopping areas in the city with its distinctly oriental atmosphere. and save up to 75% OFF normal room rates. If you're looking for cheap clothes, fabrics, souvenirs, electronic items, watches, DVDs, CDs and more? Then Petaling Street is the place for you. It is easy getting to Petaling Street. Take a taxi, but also numerous bus companies service the area. To get the best atmosphere you must go at night! 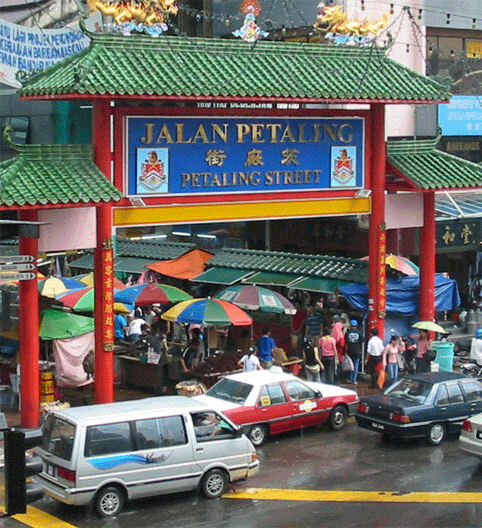 Petaling Street is particularly famous for its all-day parade of stalls, that sell imitation goods of all sorts, like: wallets, handbags, t-shirts, watches, shoes and many other things. You can buy imitation goods of Rolex, Seiko, Cartier, Christian Dior, Adidas, Nike, Calvin Klein, Armani, Gucci, Prada, D&G,Louis Vuitton. Bargaining here is an absolute must. Bargain hard! It's the ideal place to test your bargaining skills. The area attracts many locals and visitors in search of bargain items, including inexpensive dresses, sunglasses, shoes, fabrics and souvenirs. You can get anything from food to bags and sunglasses to handicrafts all along Petaling Street. The police is taking action against the illegal cd's and dvd's. I think the copying is done in Malaysia. The selling of these illegal cd's and dvd's is also in Petaling Street. I don't know, how it works, but................ the salesmen get a phone call, that the police is coming in a quarter of an hour. In a few minutes they break up and the van is loaded and of they go. Then the police arrives and find no cd or dvd on the market. I think their informant must in or near the police station. Be warned though that it can get rather crowded sometimes. You should be prepared to sweat it out. The crowd and the noise are really part of the fun of visiting Petaling Street. Without these, it just wouldn�t be right. Chinatown is also known for its jewellery shops with their fascinating variety of fine jewellery items beautifully crafted in gold and set with priceless gemstones. You can also have a look out for Chinese pharmacies, that sell ginseng and all sort of traditional remedies for all sorts of ailments. There are many restaurants with a lot of delicious choices to choose from. Some of the restaurants here have been operating for generations! We're sure, your dinner is fantastic. Look out for Yook Woo Hin restaurant on Petaling Street. It is one the longest surviving family-run food places in KL. Expect queues, shouting and fantastic food.